Go with this eco-friendly cookware set! If you are interested in "going green" with eco-cookware, then try this Ecolution Elements 3-Piece Fry Pan Set-Grey. 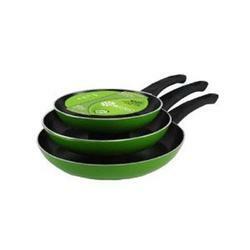 Pan fry cooking is a delight using these green pans offering a PFOA free water based Hydrolon nonstick coating. Eco-friendly, comfortable handles, and dishwasher safe__all features you will want for today's quick fix meals for busy families. Aluminum construction Insures consistent, reliable heating. Eco-friendly non stick coating Is PFOA free water based Hydrolon, and provides easy frying pan cooking and clean-up. Comfortable handles Are stay cool and provide an easy grip for lifting and holding frypans while removing prepared food. Dishwasher safe Offers time-saving for cook with faster, easier clean-up. Grey finish Is attractive accent color for today's kitchens.